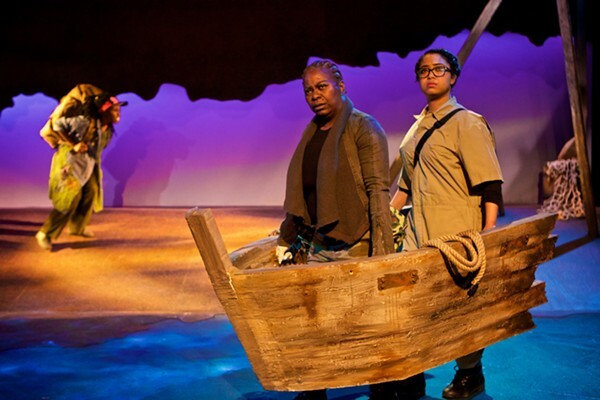 Through 4/28: Thu-Sat 8 PM, Sun 2:30 PM, Victory Gardens Theater, 2433 N. Lincoln, 773-871-3000, victorygardens.org, $20-$30, $15 students and seniors. Wolfram Lotz's fractured take on Joseph Conrad's Heart of Darkness (and its famous cinematic version, Apocalypse Now) started out as a radio script, inspired by the 2010 trial of Somali pirates in Hamburg. In Sideshow Theatre Company's hallucinatory staging of Lotz's script (translated by Daniel Brunet and adapted by director Ian Damont Martin), we're thrust into a disjointed world that moves between "Oaktown" (aka Oakland, California), where a young pirate (Meagan Dilworth) faces trial and offers a meandering explanation to the court, and a dark river journey straight out of Conrad. With a combination of physical theater and dance, projections, sound, and a nimble ensemble playing a variety of roles, Martin's staging keeps us off balance and occasionally befuddled. But as Lotz's story becomes less about piracy and more about state-sanctioned violence in the age of Black Lives Matter, it takes on more urgency and clarity. The dynamic between RjW Mays's stolid Sergeant Pellner, sent to liquidate a mysterious rogue colonel, and his eager-to-please-but-fearful assistant, Stefan Dorsch (Brittani Yawn) jackknifes between small humorous interludes and growing clammy desperation.